The quality customer service is paramount to people who have direct contact with the client face to face and by telephone. This seminar will help you understand the factors that affect the quality of service and will provide you with the skills that are necessary to build relationships with your customers and thus a loyal clientele. • To understand what is quality customer service and what service culture. • To understand the impact of customer service to increase turnover. 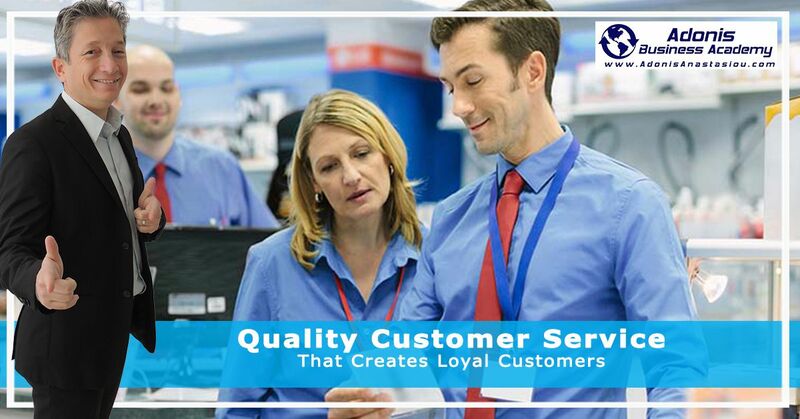 • Know the factors that determine the quality of customer service. • Develop good customer service skills. • Take corrective action when there is a difference between customer expectations and actual service. • Communicate effectively with your customers. • To apply prevention systems and addressing poor customer service. • Handle difficult and dissatisfied customers. • To build enduring relationships with your customers who will recommend you to new customers. • To differentiate yourself from your competitors on the quality of service. • Make your customers remember you for a lifetime. • For those who would like lunch there is an additional cost of €30. Due to limited seating book your ticket from the bottom of this page. • The program is approved by the HRDA. Employees working in companies and pay social securities are entitled to the subsidy of HRDA. After registering we will send you an application that should be filled by your employer. • Self-employees and employees in government organizations are not eligible for subsidies but we provide a discount from €263 to €195 + VAT. • Unemployed are allowed one free seminar participation per year if they get a permit from the office where they register as unemployed. Due to a limited number of seats buy your ticket online at the bottom of this page.